Understand how Analytics Templates can make a difference to your business. Describe how Analytics Templates give you a fast way to distribute Einstein Analytics apps. Log in to your special Developer Edition org and get started with your first templates. You’re the super admin for DTC electronics. Super because you’ve set up and taken care of DTC’s ever-expanding Salesforce implementation from Day 1. That includes working with Einstein Analytics—building explorations, lenses, datasets, dashboards, and even apps. This module requires at least basic understanding of Einstein Analytics and Analytics apps. You can get started by taking the basic Einstein Analytics modules and consulting Einstein Analytics Help. See the Resources section at the end of this unit. You’ve been swimming with the big fish, too: In response to requirements from DTC management, you’ve implemented a few solutions by writing code. You’ve created recipes and written XMD to enhance datasets, done JSON coding to optimize dashboards, and written custom SAQL queries. You’ve even dabbled with Apex and the Analytics APIs. You’re not a developer yet, but you’re getting there! DTC’s enthusiastic CEO just paid you a visit to issue you a new challenge: She “loves, loves, loves” Execs Only, the new Einstein Analytics app you and the DTC Analysts group just created. You built it so the executive team could get instantaneous insights from top-level sales data in Salesforce. Even as she speaks, she’s got Analytics Studio open on her laptop to show you what she means. “It’s so cool! I open the app, and get everything I need. And only what I need, all in one place,” she says as you peer over her shoulder. She says she used Execs Only during a retreat with a core group of DTC’s distribution partners. She held the retreat because she heard about a new competitor trying to woo some of DTC’s partners. The retreat was all about getting the partners jazzed about DTC, and making sure they had everything they needed to make it easy to sell DTC products. As usual, you’re way ahead of the curve: You just read about a new developer technology in Salesforce Release Notes called Analytics Templates. They give you the power to package and distribute your apps to others in your company and to partners, even to sell them to customers. They can then use the template to create their own versions of the app using their Salesforce data. The DTC admin might be you. Maybe you’ve just started working with the Analytics platform. Or maybe you already have an app in production. 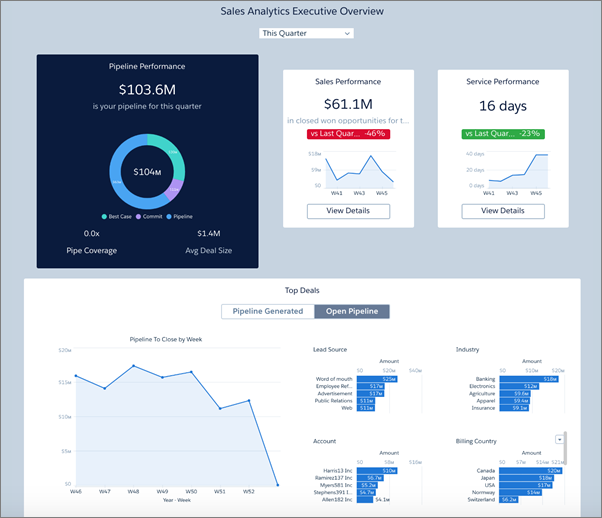 In either case, Templates can help you make the most of your Salesforce Analytics-based solutions. In this module, you’re going to learn all about templates. You’ll see what they are and delve into the concepts you need to understand to master them. You’ll learn some of the techniques you use to customize them for your business needs. And you’ll see how they work, up close, as we make subtle changes to a template that deliver powerful user features. Harnessing that power takes advanced admin skills. In this case, you need to be comfortable with JSON, or have access to a developer in your company who can help. But we think you’ll find it more than worthwhile. You may not have the development skills of the DTC super admin. But even if you’re relatively new to JSON, you can understand the examples in this module. They start you on the path to developing your own templates. You won’t actually create a template yourself, or edit the template files. Instead, we’ll show you the files and take you through the process you’d use to customize your own templates. If you want to follow along with the actual files, you can download them from the link in the Resources section at the end of this unit. For this trail, you can’t use an existing Developer Edition org, even if you’ve previously set one up. You must sign up for a new Analytics Developer Edition account, which comes with a limited version of the licenses for your app and contains sample data for this Trailhead module. Let’s get you set up so you can log in and start working with templates. Go to your email and look for an activation email. Open it, and click the link. Write down or remember your credentials. Click Save. That logs you in to your new Analytics Developer Edition org. Way to go! You now have a Salesforce org complete with DTC Electronics sales data, and you’re ready to see templates in action. But first, start working toward your Develop with Analytics Templates badge by answering these questions. Download the code for this module. The download includes two files: EATP1 contains the basic Template 1, which you use to create an app in the next unit. EATP2 contains Template 2, which includes the modifications described later in the module.